Ownership / Access: Some rooms houses Islamic art pieces, tools and artifacts from the Mediterranean area, Open to public. 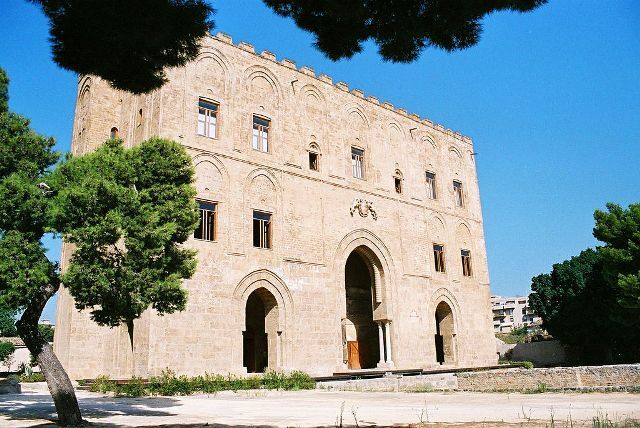 Notes: The Zisa is a castle in the western part of Palermo in Sicily, southern Italy. It is included in the UNESCO Arab-Norman Palermo and the Cathedral Churches of Cefalù and Monreale World Heritage Site. The construction was begun in the 12th century by Arabian craftsmen for king William I of Sicily, and completed by his son William II. The edifice had been conceived as summer residence for the Norman kings, as a part of the large hunting resort known as Genoardo (Arabic: Jannat al-arḍ, literally "Paradise on Earth") that included also the Cuba Sottana, the Cuba Soprana and the Uscibene palace. The Zisa is clearly inspired by Moorish architecture. The name Zisa itself derives from the Arab term al-Azīz, meaning "dear" or "splendid". The same word, in Naskh script, is impressed in the entrance, according to the usual habit for the main Islamic edifices of the time.In the 14th century merlons were added, by partly destroying the Arab inscription (in Kufic characters) which embellished the upper part of the edifice. More substantial modifications were introduced in the 17th century, when the Zisa, reduced to very poor conditions, was purchased by Giovanni di Sandoval e Platamone, Marquis of S. Giovanni la Mendola, Prince of Castelreale, Lord of the Mezzagrana and the Zisa. The latter's marble coat of arms with two lions can be seen over the entrance fornix. Several rooms of the interior were modified and others added on the ceiling, a great stair was built, as well as new external windows. From 1808 to the 1950s the building was used a residence by the princes Notarbartolo di Sciara. Acquired by the Region of Sicilia and restored in the 1970s and 1980s (the Northern part had crumbled down in 1971 and has been rebuilt along the original lines), the Zisa today is opened to tourists. Some rooms houses Islamic art pieces, tools and artifacts from the Mediterranean area. The most notable room is the central hall, with a mosaic decoration; once it had a fountain too, from which the water flowed outside. On 3 July 2015 it became UNESCO World Heritage Site.